I have read in the online news that Ng Eng Hen has told Parliament that “MINDEF and the SAF will hold ourselves accountable to every NS men entrusted to us”. That is a very comforting and strong assurance but I ask, how exactly? Last year, Ng Eng Hen told Parliament that Singapore, will be sending more of our soldiers to war-torn and dangerous places like Iraq and Afghanistan to help the United States in their efforts at fighting terrorism. Although Singaporean soldiers may not be deployed in the frontlines, still the dangers are ever present. Stray bullets have no eyes and road side mines are plentiful. I am strongly against sending our ground troops to places like Iraq and Afghanistan as I do not want to see even one of our boys comes home in body bag or coffin. I will say this very loudly and clearly to Ng Eng Hen. If you, MINDEF and the SAF are really, really serious in holding yourself accountable for every NS men entrusted to you, then our ground troops have absolutely no business to be in Iraq or Afghanistan. We are only a very small country with a very small citizen military and we must be ever mindful of our limitations. As a responsible member of the international community, I support our participation in the global war on terror but we can and should contribute in other useful ways such as offering of medical assistance or intelligence exchanges or logistical support such as the offering of our aerial tankers for mid-air refuelling but to send in our ground troops must be a firm and definite “NO”! It is not far-fetched to think to think that even if we commit our ground troops merely to teach the local people how to defend themselves and not fighting alongside the US soldiers, the possibility of our soldiers being maimed or killed is still very real. To say “no” to the United States’ request for us to send in ground troops requires courage; I doubt if Ng Eng Hen has enough courage to stand firm when our soldiers’ lives are on the line. I sincerely hope that the PAP government and Ng Eng Hen in particular reconsider Singapore’s role in this war on global terror led by the United States. Otherwise, if there is absolutely no danger over there, can the PAP government guarantees all Singaporean families that their sons, brothers or husbands will come home alive and in one piece? Singapore is prominent member of international community and USA is our biggest ally for security purpose. If they request troops, we must contribute. Go Iraq and Afghanistan is very good for our soldiers because the experience they get will help them cope with war with any country. Simple Simon, you really must grow up.. If Ng Eng Hen is truly committed to sending our troops to Afghanistan and Iraq, perhaps he should send one of the brilliant scholar sons of Ministers or PAP MPs to lead our troops in these dangerous zones. It’s easy to sit behind a desk and talk about safety, defence and being committed to Singapore. Whose sons are we talking about? Our paper generals need some experience, why not send them there. When they come back alive they can brag about it. Send our Paper Generals there? I agree they send Kee Chui there to lecture the American Generals how to fight. I am sure they will die, LAUGHING! Brother, get your facts right before you open your mouth. Only regulars not NS boys are sent there !! Don’t belittle our Paper Generals. Who knows they may be the ultimate ‘secret weapon’ like the MOAB? First deploy them to the front. Enemy cannot stop laughing and the US drones caught the enemy off-guard and pulverize them in one fell swop. Do you know that we all have the blood of children and women of the middle east on our hands? Do you know that Singapore is among the largest buyers of expensive military toys from the USA? Do you know that we need to spend so much to buy military toys because this is how we transfer $$$ to feed the US’ military expeditions across the world? We are going to buy many F-35 fighter jets. Do you know that we can’t say NO to the USA when we are being asked to buy? The Great Asia has said a few years ago, we would buy F-35 and PAP would do wayang to make it like we have “selected” the US made stealth fighters. The only way to stop the killing of innocent people is to stop the war. We are celebrating the 200th anniversary of the arrival of our colonial master. So now you know which country the angmoh worshiping PAP bananas are loyal to? One day USA will ask $G to sacrifice for ‘freedom’. I hope $G NSF / Regular ready to die for ‘freedom’. Also patriotic parents who vote pappy should not complain – be ready for your sons’ funerals. Can happen anytime anywhere anyplace. FT must be protected at all costs. Your sons are expendable. It’s never been about the interests of the ordinary soldiers. It’s about meritocracy, it’s the career of the scholar soldiers. Just like I have said many times, in NTUC’s entire existence it has never helped the poor hawker stall assistants, cleaners and other low-income Singaporeans. It’s about the high profile career of the honchos of NUTC. It’s meritocracy, it can’t be helped. We are just the stepping stones. If China and the USA go to war in the South China Sea, the PLA will have to take out Singapore. If Russia and the USA go to war, the Russians will have to take out Singapore. Because the PAP has made Singapore to become the unsinkable aircraft carrier of the USA. And the UK is coming here soon. Russia and China will not allow the US bombers and battleships to use Singapore as a base to attack them. Do you know why the Malaysians keep coming into Singapore’s water at Tuas? Do you think the PAP bananas will tell you the truth? I work as a civilian contractor Doctor at east orange new Jersey and Philly, Pennsylvania. Seen at lot of ‘wounded warriors’. Believe me when I say you don’t want to send your young men to the Middle east, gulf, Afghanistan. Young men in 20s without legs and arms. Traumatic brain injury, PTSD.. It is real sad. Their whole life gone. But I don’t mind sending the millionaire paper generals over. Since they got paid so much, they should prove and show their worth. Already lowest fertility rate in the world and as a doctor for years, NEH’s show of fake compassion on servicemen deaths came too late and too little. Of course, we all know that neither him nor his army chiefs are taking any responsibilities. Of course, we all know it is because elections are looming. Try sending minister sons to Afghan for active service and reservist instead of getting the media to publicise a parking app from PM Lee’s son. Lead by example, not opt for 12 years deferment and then come out to proclaim the pride of serving NS. What can we learn from the US? Learn to drop bombs on children and women? Why don’t you aks your American papa to declare war on the mighty Russia or China? Singapore has become a puppy of the US because a shallow banana is the PM. We are being told that Chinese Singaporeans are different from the Chinese from China because they are more high class – they speak English. We are being told that Malay Singaporeans are different from the Malays in Malaysia because they are more high class – they speak English. We are being told that we have a different history from the Malaysians – because we worship angmohs, we celebrate colonialism. We’ll be doomed if we allow bananas and their angmoh masters to make Singapore be the Isreal of ASEAN. 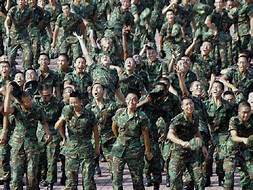 Singapore’s armed forces are like the suicide vest of a suicide bomber – can use only one time. Shallow angmoh worshipping monkeys should grow up fast. Wow. You really are trying hard to sell horse manure. Care to bring up this conversation point in public? Here in Singapore, our neo-colonial masters, the ruling bananas want us to celebrate colonialism. They want ask to worship their angmoh masters. For months, our Terrexes were ‘annexed’ and its’ technical hardware/software examined by mainland China. Polaris blatantly intruded into our sovereign waters and staying put. And you say, Singapore is a prominent international community and USA our biggest ally? We are not cowards like the Ministers sons. We will fight to the death when our survival is threatened. However since PC Ong is so keen to fight in Iraq and Afghanistan. we recommend that he volunteers his services to fight and die there. Go ahead and do it. At least we can get rid of one big idiot from Spore. Deployment overseas is meant for regular soldiers only–not NS personnel. So I think those paper generals should go and not as support either but in the front lines so that they can get some respect from their fellow Singaporeans. At the moment they are referred to in a rather derogatory sense as paper generals. If you fight in a war or a conflict zone they can no longer be called “paper” generals. So are they going to volunteer? Talk only why not send white horses there including people doing lab work only. Can’t stand it. aiyoh. read up more on the war lar. don’t happy happy ‘support’ lar. in the old days, leaders led from the front during wars / battles, that’s why you got to see them minus one eye or minus one hand or leg. nowadays, leaders are ‘smart’ (kiasi in the front but very brave with motherhood statement from behind). Now, they lead (preach) from behind the scene far away from danger and have so many plp kakis (paid well) to sell their propaganda but then there are too many brainwashed lower ranked daft who are willing to listen to their fairy tales. Send he son(s) there if he dares lor! Coward as he sure dare not. Sure one!!! He He, PC Ong is an old man, Mindef won’t even consider drafting this moron in, far too old lah, dun have strength to even carry a gun, how to fight, even have to take viagra (unless he is woman), how to fight. Send Kee Chui over, must prove made of better stuff other than ever blowing trumpet the moment opens his mouth. Yes he is very serous, look at the way he answered the Nation. All of you mai chup, I am in charge, life threatening can donât go. Die then kpkb for what, traiining mah. Who truly believes minister Gan. @the Parliament session trying to convince us sgs re the hiv data leak Was Not a cover up. Somehow his body language , as well as the other ministers present, seemed to say otherwise. Dont know how much is lies. PAP Mission Statement is well perceived by Singaporeans as PAP Fakes plps dressed them to look real. PAP perceived that the mandate to govern is to serve PAP n its plps regardless of their loyalty as long as it is not in the interests of inquiring Singaporeans n to right whatever the Biws do as they desire by redefining regardlessly as long as it serves them but absolutely not applicable to anyone who cannot meet the criteria of scums n shits. No problem , subsequently another take over can also change back.